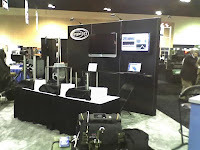 I'm in Florida this week, manning my company's booth at the SOFIC Special Ops Forces Trade Show. This trade show is kind of like the winery trade show I went to a while back, except instead of selling wine stuff, they're selling death and destruction. 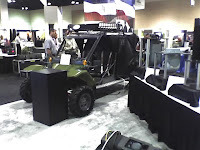 There were all kinds of exhibits of guns, RPGs, body armor, SCUBA rebreathers, UAVs... you name it. I was walking the floor of the show and happened upon a bloody and dismembered mannequin lying pathetically on the floor. He had blood all over him, his face was frozen in a death scream, and bones spurted from what was left of his limbs. Really nice. Eddie would have fainted cold from shock just seeing it. Luke would have thought it was cool. I guess it was some kind of medical trainer, but I could have done without seeing it myself. 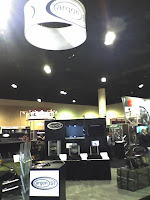 Anyhow, trade shows like these are always a little tedious. It doesn't help that I don't like talking to people that I don't know. Plus, most people aren't truly interested in your work anyway, since they just want to grab the free flashlight or sunglasses you're offering and beat cheeks to the next booth. And standing on your feet all day as a "booth babe" is wearing. I've done dozens of shows like these, both in the government sector and in my old telecom sector, and I have yet to ever hear of a single business lead from a show like this. Frankly, the wine show was more entertaining. Sorry we weren't both in the same place in FL! Would have been great to get together. Your post brought a smile to my face - I snuck into all the vendor booths during our conference while they were all at lunch so I could take their freebies without having to talk to anyone :) Drew loves his flashing bouncy ball that I picked up & Corry likes her double sided thin & thick tipped pink highlighter. I think I probably won't go to any more trade shows either. It just gets me a bunch of nuisance calls & emails afterwards. It sounds like Luke would have loved all that death & destruction! Hey, remember, everyone at those trade shows is giving away promotional products, which forms the basis for my living and Sandi's travels. Go to all you can and ask for all the trinkets you can get and just know you are increasing my wealth.